The post-financial crisis bear market bottomed out a long time ago, in March 2009; it is only natural that investors should be asking how much longer the bull can keep running. I think there are three main reasons to be concerned. Here we dig into these, before looking at reasons for optimism, and ways to approach the market given these mixed messages. 1) First of these is the length of the bull market. 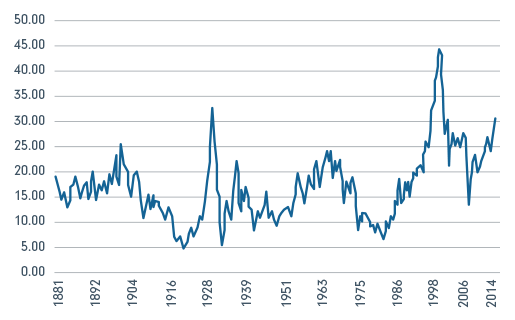 The current period of rising prices now ranks second in terms of duration, still shorter than the great bull market of 1990-2000 but longer than those from 1982-1987, from 2002-2007 and, for those with really long investing memories, from 1962-1968 and from 1974-1980. The fact that a bull market has been running for a long time is, of course, not a reason to expect it to end but, as each month goes on, it is inevitable that we will fret more about its sustainability. 2) The second principal reason to worry that a correction may be looming is the market’s valuation. In an environment of low growth and historically low interest rates, investors have been increasingly willing to pay up for the growth which companies have been able to provide. Prices have risen ever higher, heaping pressure on companies to deliver better results to justify higher ratings. As the chart here shows, the ratio of share prices to profits is higher today than throughout most of the past hundred and more years. Only ahead of significant market declines has the stock market been more expensive. 3) The third reason to worry is the increasing narrowness of the market leadership. A small handful of technology stocks is responsible for a high proportion of the market’s gains in recent months. Strip out the performance of the so-called FANGs - companies like Apple, Google-owner Alphabet and Facebook - and the overall performance of the market is less impressive. One of the biggest challenges of reflection, however, is the ease with which these concerns can be offset by good reasons to stick with your investments. I think there are four important ones. First, on the valuation question, while high valuations are a necessary condition for a market correction they are not a sufficient one. There is a plausible argument that things really are different this time. Bond yields are low and likely to remain so. In such an environment a case can be made for higher than normal equity valuations. Prices can stay higher for longer just as interest rates can stay lower for longer. Second, although profit margins have risen to historically high levels, it is possible that they might stay at these elevated levels for some time. There is no real upward pressure on wages, the cost of borrowing is low and likely to stay so and changes in the ability of companies to grow with little capital investment has tilted the balance of power significantly from workers to shareholders. Third, bull markets rarely come to an end in the absence of recession and this looks unlikely for the foreseeable future. Even when organisations like the International Monetary Fund have reduced their growth expectations this year they have continued to forecast positive growth in almost every country around the world. In some emerging markets, such as India and China, the growth in economic activity continues at levels that would double the size of the economy in a dozen years or so. Finally, there is the question of sentiment. Bull markets tend to grind higher as long as there is an absence of investor enthusiasm. Even after eight years of rising prices, investors remain nervous. The very fact that we are weighing up the positives and negatives as I have done here is a reason to remain invested. The time to worry is when no-one is worried. So these are the competing market views that I’ve been mulling during the last few quiet weeks. What conclusion have I come to? Well, I’ve decided that I’m comfortable remaining largely invested in a very well-diversified portfolio, by assets and by geography. However, I’ve also decided at the margin to slightly raise the proportion of my investments and super held in cash. I’ve done this for three reasons. First, because like many investors I have enjoyed a good run in recent years and I believe in Warren Buffett’s famous adage about managing a portfolio. Rule number one: don’t lose money. Rule number two: never forget rule number one. Second, because if there is a market correction in the offing I want to be able to capitalise on what could be a temporary fall in prices to attractive levels. There is no point judging that the market has over-reacted if I have no ammunition to take advantage. Third, because my ability to ride out the ups and downs of the market and my tolerance for loss is naturally declining as the years roll by. At the age of 34 I would happily accept the ups and downs of the market. At 54, I want a slightly smoother ride. Ultimately investing is an art not a science; it demands logic and rationality but it is essentially an emotional activity. You have to do what feels right for you. I have accepted a trade-off. If the market continues to rise I will make a little less than I would have otherwise done. If it falls from here, my pain will be a bit less and I will have the wherewithal to repair the damage by re-investing at a lower level. Most importantly, I’m happy with the decision I’ve made - whatever the outcome. It’s been time well spent this summer.